Never have I seen a more conflicted place than the bedside of a patient. The nurse’s mission is clear: take care of the patient. But then come the competing values: safety, privacy, dignity, financial stewardship. For the pilot of the airliner, we try to simplify the task; pilots don’t have to pour cocktails and de-escalate an unruly passenger while simultaneously flying an instrument approach. Most jobs are not so conflict free. Most jobs entail making choices among competing values, or values that compete with our reason for being. It’s often been said that the safest airplane is the one that doesn’t fly – but that sorta defeats the purpose of an airline. In the real world, production goals compete with safety; safety competes with cost control; cost control competes with customer experience; customer experience competes with production. It’s nice to believe that most of these conflicts have been worked out ahead of time, as it has been for the pilots of an airliner. Just lock them in the flight deck and tell them they have but one job to do – fly the aircraft. Again, most jobs are not so conflict free. Every organizational value needs a champion because we humans are simply too susceptible to making objectively bad choices. Champions act to advocate for a value that might easily be forsaken by those of us caught up in day-to-day action. Champions fight for resources. They are a shoulder to lean on, a coach in our corner when we need help, maybe, even, a restraint on our own freedom to make bad choices. Consider American football and our collective angst about head injuries. It’s the final game of the season. Yes, the quarterback just got walloped, and is now wandering around the field looking like a soccer fan coming out of a pub at 2:00 am. But have you seen our second-string quarterback try to throw the ball? Football is about winning, and we’re down by three points with four minutes to go. Not to mention, your performance incentives are based upon your ability to win! “Sorry coach, we’re going to bench the quarterback. Concussion protocol,” says the physician on the sidelines, wielding her independent authority to remove a player at unjustifiable risk of further harm. Champions try to protect us from our own flawed brains – that brain capable of putting the winning of a single game ahead of the long-term health of a human being. They also protect us from blind personal ambition – where a coach, or an entire program, might excuse an abusive assistant coach simply to pursue a national championship. Who among us hasn’t met managers that put production ahead of safety, put hiring friends ahead of equal opportunity, or simply disliked a group of people because they didn’t look like themselves? Intellectually, most of us get the values – we just often find it difficult to get our reality to align with our virtue. Anyone who knows our work at Outcome Engenuity knows we’ve been steadfastly championing the cause of workplace justice for more than two decades. For many in the safety profession, the “just culture” has been about creating a more just view toward our inescapable fallibility. But that version of “just culture” is only the tip of the justice iceberg. A look at employment law in the United States reveals a workplace historically devoid of justice. We Americans came charging out of the industrial revolution with the deeply-embedded doctrine of employment-at-will – that employment was simply an arms-length business transaction. As an employee working in an inner-city sweat shop in the early 1900’s, you may have had the freedom to quit whenever you wished, but your employer had the freedom to terminate your employment whenever they wished, for good cause, no cause, and even bad cause. In the last 60 years, labor laws have whittled away at the injustice of “bad cause.” Today, you cannot legally refuse to hire, or choose to fire, because of a person’s gender, religious preference, or the color of their skin. And as we continue to collectively push for a more “just” culture, it is the Human Resources Officer and Human Resources team that must continue to champion workplace justice, whether that be how the organization responds to our inescapable fallibility, our ever-present self-interest, or our cancerous prejudice toward others. Let the Chief Safety Officer advocate for safety, the Chief Financial Officer fight for financial stewardship, and let the Chief Human Resources Officer be the advocate for workplace justice. 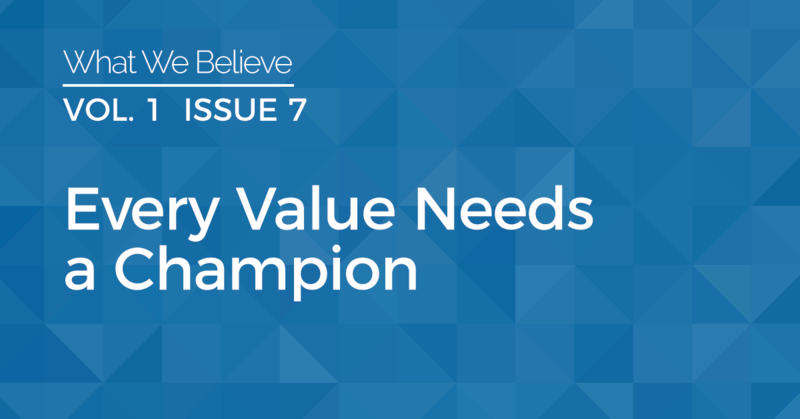 Because every value needs a champion.